SpaceX will attempt to launch their privately-developed Falcon 1 rocket for the third time Saturday evening, the company announced just hours before the appointed liftoff time. The 70-foot-tall two-stage rocket is on track for blastoff at 7 p.m. EDT (2300 GMT) Saturday, the opening of a five-hour launch window that extends until midnight EDT (0400 GMT) Sunday, according to a SpaceX statement. The window opens at 11 a.m. local time at the company's launch site in the Marshall Islands. 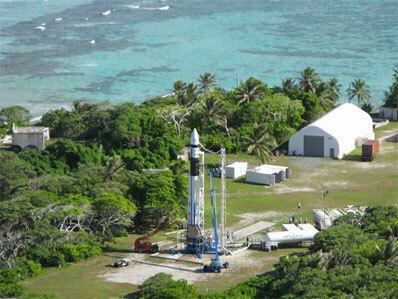 Falcon 1 facilities are located on Omelek Island, a seven-acre stretch of land at the U.S. Army's Reagan Test Site at Kwajalein Atoll in the central Pacific Ocean. The launch will mark the company's third try launching the Falcon 1, billed as the world's first privately-developed liquid-fueled rocket. SpaceX founder Elon Musk, a former Internet entrepreneur, funded the rocket's development from his own fortune. The rocket's two previous missions failed to reach orbit. The Falcon 1's maiden flight in 2006 succumbed to a fuel leak and engine fire a few seconds after liftoff. The second mission reached space in March 2007, but the rocket's second stage spun out of control due to propellant sloshing the liquid oxygen tank. SpaceX has installed baffles on subsequent Falcon 1 rockets to prevent a similar problem from happening again. Saturday's flight will be a critical test for SpaceX, which holds contracts for up to 11 future missions for commercial and government customers but has never successfully launched a rocket into orbit. SpaceX is busy developing the Falcon 9 rocket, which will be able to lift large payloads into orbit and compete with Atlas and Delta launchers. The Falcon 1's first stage Merlin engine underwent a comprehensive overhaul over the past year. Engineers added a new cooling system to the engine using kerosene flowing through the walls of the Merlin's combustion chamber and nozzle to help dissipate heat. Earlier models of the Merlin used an ablative material inside the nozzle to cool the engine. The Merlin, burning kerosene and liquid oxygen propellants, will ignite a few moments before launch to build up to 78,000 pounds of thrust as computers check the rocket's systems to ensure the vehicle is ready for flight. The Falcon 1 will clear the launch tower in the first four seconds of the mission as it blazes skyward away from Omelek Island. After a two-and-a-half minute burn, the Merlin will shut down and the first stage will drop away from the rocket. The second stage's Kestrel engine, also fueled by kerosene and liquid oxygen, will ignite a few seconds later. The Falcon 1's payload fairing will be jettisoned at the three-minute, 13-second point of the mission. The nose cone shields the payloads as the rocket flies through the dense lower atmosphere. The Kestrel engine will switch off nine minutes, 37 seconds after liftoff as the rocket reaches orbit. The launcher is targeting an orbit with a high point of 426 miles, a low point of 205 miles, and an inclination of 9 degrees, according to SpaceX. "The primary goal is just to deliver the satellites into orbit," said Diane Murphy, a SpaceX spokesperson. The mission's primary payload, the Trailblazer satellite built by SpaceDev Inc., is scheduled to separate from the second stage about ten seconds after engine cutoff. The 184-pound Trailblazer satellite was one of three payloads considered for the mission by the Pentagon's Operationally Responsive Space Office. Codenamed Jumpstart, the mission's objective is to demonstrate the rapid construction, testing and launch of a low-cost satellite for the military. Officials evaluated three payloads for the mission, eventually selecting Trailblazer during a pre-shipment review in May. The satellite was built in less than five months, meeting schedule and budget criteria set by the ORS program office, according to SpaceDev. After passing out of range of communications ground stations near the launch site, the Falcon 1 will deploy two tiny NASA payloads. PRESat, a 10-pound satellite developed by NASA's Ames Research Center, will be released about 14 minutes after liftoff. The spacecraft's two-month mission will monitor the growth of microorganisms housed inside a miniature life sciences laboratory. NanoSail-D will separate from the rocket about 18 minutes into the mission. The craft will be the first satellite to fully deploy a solar sail, which uses light pressure from the sun to change the velocity of objects traveling in space. Made of extremely lightweight aluminum-coated gossamer material, the sail will stretch up to 100 square feet. Ground measurements of the satellite's orbit will help scientists determine if the sail is changing the velocity of the spacecraft, NASA officials said. The Falcon 1's third mission is also carrying the cremated remains of more than 200 people, including astronaut Gordon Cooper and Star Trek actor James Doohan. The ashes are carried in a capsule provided by Space Services Inc. 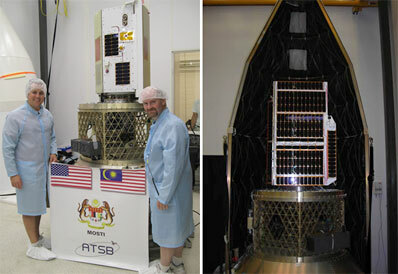 The payloads are attached to an adapter developed by ATSB, a Malaysian company that also owns RazakSat, the payload for the Falcon 1's next flight later this year.